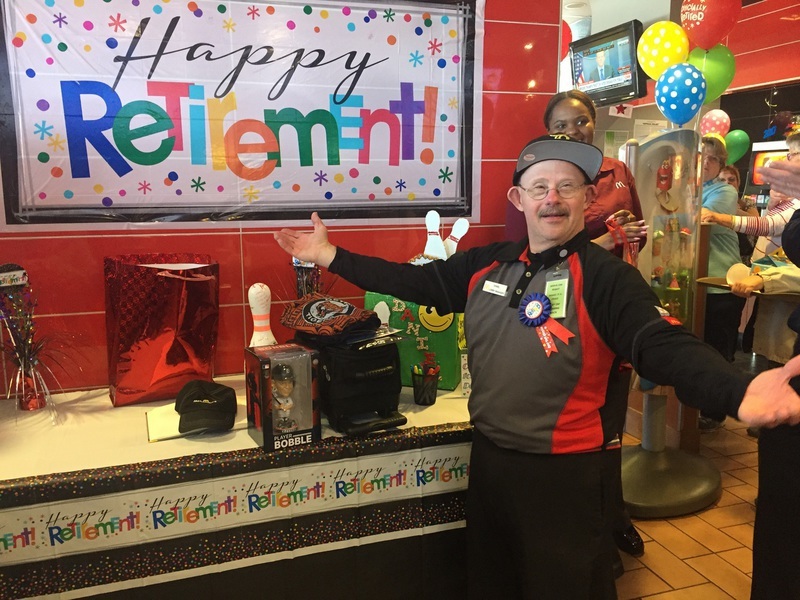 After 33 years of dedicated service, a longtime employee of a local McDonald’s celebrated his retirement Monday surrounded by friends and family. Daniel Lybrink of Howell began working at McDonald’s in April of 1984 as the “lobby manager”. With over three decades of service under his belt, Daniel, who has Down Syndrome, is known for his work ethic and contagious smile. A surprise party celebrating Daniel’s retirement was held at the Brighton McDonald’s Monday, filling the lobby with his friends, family, and community members who have all been impacted by Daniel’s lovable personality. The event included cake, gifts, and a memory book for guests to sign. David Glynn, General Manager at the Brighton McDonald’s, has worked with Daniel for 13 years. Above all else, he says Daniel “makes everybody feel special”. Glynn’s praise was echoed by Daniel’s co-worker, Ruthan Knarr, who describes Daniel as a responsible, polite, and courteous employee, as well as the sweetest man she’s ever met. He is always smiling no matter what kind of day he’s having, according to staff member Rachel Meredith. Daniel says his fellow employees are his “other family” and that he felt pride seeing how many people showed up to his party to celebrate him. Speaking in reference to his job, Daniel jokingly says “I don’t ever leave”, and is looking forward to retirement. Molly Wisuri, Daniel’s caregiver of 16 years, says in June she will be moving him and his roommates from their place in Fowlerville to Manistee near Lake Michigan. There, Wisuri says he and his roommates will enjoy retirement and the rest of their lives together with plans for lots of fishing, traveling, and continuing to participate in Special Olympics.